“Growing up as a third culture kid in a military family may have destined me for a life of travel and voluntary chaos,” David says on the about page on his website. Along with his wife, Sarah, they worked for a combined fourteen years for Amazon, the online megastore everyone’s come to know and, usually, love. In 2011, the company moved them to Luxembourg. Two years later, now married, David, Sarah and their brand new baby boy were transferred to Cape Town, South Africa. In our sedentary life, I felt deadened. It was hard to get excited. So while you could say travel has been running in the family long before it even existed, that’s where this story begins. The story of the Luxpats. Her husband spent his days off at work while she stayed home and watched their new house slowly succumb to water damage. “I would spend the mornings on the phone and email with contractors and lawyers while our nanny watched the baby. David would come home at seven, ten minutes before Spencer’s bedtime, and everyone was stressed.” The signs of a life of normalcy, one that not only the American dream has convinced so many of us to buy into, but apparently one which much of the Westernized World is beginning to fall for. Ideas began to form. An escape plan, you might say. So, they decided to pack it up and leave. Along the way, they founded Nomadica, an online store where they sell gear to their fellow travelers. Specifically, they curate lightweight, durable gear that they’ve found to be great for traveling the world, based on their own experiences of having done so, full-time now since 2015. Check out the family’s online store at Nomadica.io. “Specifically from companies committed to making a positive social and environmental impact on the world,” David writes on their company website. “Travel Well, Do No Harm.” That’s the companies motto. The goal, after all, was to spend less time working, more travel, more time with the family for David. 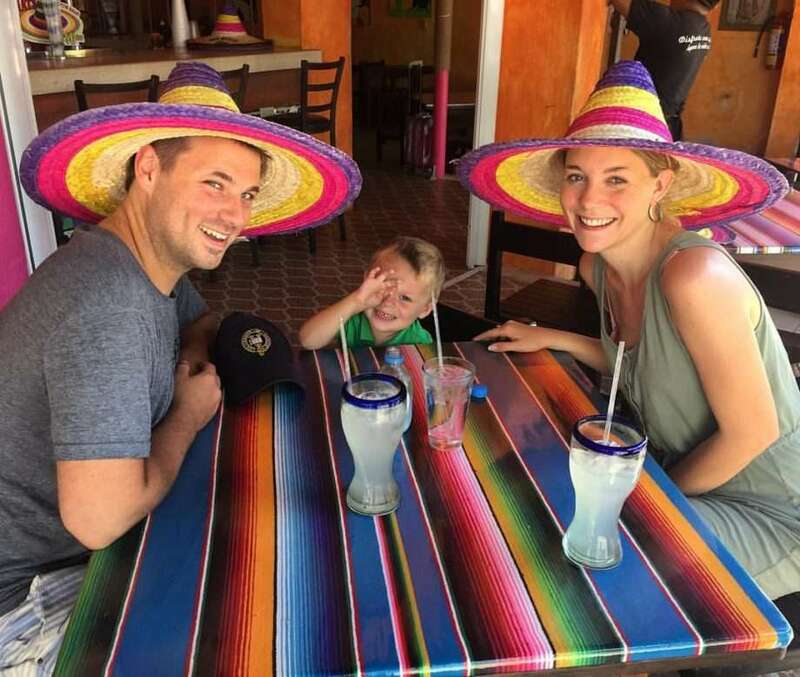 Fun in Mexico with David, Spencer and Sarah of the Luxpats. Everything in David’s past seems to have been preparing him for this way of travel. Despite being shuffled around as a military child, he didn’t lose his taste for adventure like many a child in that scenario does. Quite the opposite. Even his time at Amazon contributed. “I worked for Amazon in five locations, North Dakota, South Carolina, Washington, Luxembourg and South Africa. Amazon provided relocation assistance in each of these moves, but each move brought its own challenges. In Luxembourg, I needed to learn a bit of French and Luxembourgish. In South Africa, I had to navigate the banking system to purchase our house. Our time in Luxembourg also demanded a lot of travel.” They flew over eighty times in 2012 alone. While David focuses on the trading, Sarah’s work is in writing fiction. “My work is easy,” she smiles, “I don’t have to look for work. By stripping life down to the essentials and accepting inconvenience as the human experience, we’ve learned to be joyous again. Her new career has given her a newfound freedom to pursue “prosperity, success, and upward mobility,” as she puts it. “Now that my life is no longer sucked into house, car, and lawn maintenance, bill paying and child care, I can work for myself. I define success, and I work to make it happen. Things are a lot simpler now. Our lifestyle is low cost, which means we can actually have someone watch Spencer for part of the day while I write.” She admits that they didn’t have a high cost of living in South Africa, either, but that simply maintaining their home and that lifestyle took up nearly all of her time. While the life of a traveling writer is an aspiration many a wanderer hopes to achieve–only to be met with the failure to become famous overnight–and even as Sarah has put the effort into making her own dream a reality, dealing in trading, as David does, might seem completely out of reach for anyone who hasn’t spent years doing it. He goes on to explain how he made $5000 over the course of two weeks in 2015, and then proceeded to lose $6000 in a single hour. He explains a bit further that, on a $10k investment at 1% per week, compounded, you’d make $6,777 per year. That puts things into a bit of perspective. What’s it like for a couple where both of them are working, and yet still have a young child in the picture? “As a parent,” Sarah tells me, “you can probably relate to the ‘inconvenience’ aspect of having children. Things that were a breeze before, like getting out the door in the morning, are now a battle. Our son hates being messed with, so just showering him, dressing him, getting his teeth brushed and hair combed is always an ordeal. She explains how living in their home in South Africa, it was more about getting through the day. Since they’ve been traveling, though, everything is somewhat of an inconvenience. It’s simply the nature of the beast. You no longer have everything planned out, for every day. Every step of the way is discovering what you’ll do next, how you’ll do it, and where exactly that will all happen. “The hard parts of parenting don’t seem so bad. It’s just life. In particular, you get used to ‘setting up’ way more often that other families do. Every few months you’re going apartment hunting, signing rental contracts, figuring out transportation, looking for grocery stores. This probably sounds like hell to a sedentary family and at first, it is. But we got used to it, and now settling in is going through the motions. “I think we apply the same kind of patience to parenting now. We know that eventually his pants will be on right side out, and eventually he will stop crying about not being able to take his hair off. Spencer goes to a traditional school part of the year, and they worldschool him the rest. “To be completely honest, traditional schooling appeals to us because neither of us have the time or the inclination to teach. We both have careers that we love, and we notice that in homeschooling or world schooling families, at least one of the partners is usually devoted full-time to education. That wouldn’t work for us. And though we know world schooling families and see every day how this is working out well for them, there are parts of a traditional education that we still value. From a traditional school environment, we’d want Spencer to learn the value of discipline to a schedule, of being part of a greater community and the camaraderie of his peers, and we’d want him to learn the basics like multiplication tables, reading, and writing. Having spent years in the traveling lifestyle–visiting over 20 countries, living in six of them–the couple also offers free consulting advice to anyone looking to take up a life of constant motion. They also write a bit about their travels on their blog, but not the typical, “Go here, stay there, eat this, do that” type of blogging. They certainly don’t always skirt the subject, either. You can follow along with the Luxpats’ journey via your favorite social networks–Facebook and Instagram are ours–or their website. Step by step guide to renting vacation houses for a month to six months at a time, for the purposes of traveling full-time.